Over the last few decades, the defending champion New York Yankees had made an art out of dominating the American League on the way to their twenty-fifth Fall Classic. It was becoming all-too-predictable and the early 1960's were looking a lot like the 50's when the "Pinstripes" played in eight out of the ten world championships. On the other side of the ball, the National League's representatives were a familiar opponent to the Yanks as well as former "roommates". 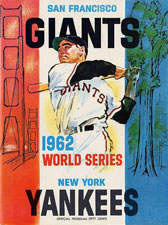 The Giants had finally recaptured the National League pennant for the first time since moving across the country to San Francisco (after the 1957 season) and it seemed fitting that the prelude to this "Subway Series" revival was a playoff between the Los Angeles Dodgers who used to call Brooklyn their home. Series veteran Whitey Ford was given his usual Game 1 start by the Yanks sophomore manager Ralph Houk and extended his World Series consecutive-innings scoreless streak to thirty-three before San Francisco got on the scoreboard in the second inning. The Giants Billy O'Dell kept pace with "The Chairman" through six innings, but finally surrendered to Clete Boyer and his fellow "Bombers" in the closing innings for a 6-2 loss. Jack Sanford got revenge the following day though with a three hit, 2-0 shutout that evened the contest at a game apiece. Billy Pierce continued the cycle in Game 3, blanking the Yankees through six innings until the newly crowned single-season homerun leader, Roger Maris, broke through the deadlock with a two run single in the seventh and eventually scored on a force-out grounder. Yankees closer Bill Stafford almost blew it in the ninth after giving up a two run blast of his own to Ed Bailey, but managed to pull it together for the 3-2 victory. Game 4 featured a rare break-out performance at the plate by the Giants' Chuck Hiller. An unlikely threat to the Yankees power pitching, the second baseman had hit only twenty home runs in his eight year Major League career. Those numbers didn't matter though as he nailed a bases-loaded homer off of Yankees reliever Marshall Bridges in the seventh. It was the first grand-slam ever in a World Series outing by a National Leaguer and snapped the two all tie that resulted in a San Francisco victory at Yankees Stadium. In a strange twist the winning Giants reliever was none other than Don Larsen who (exactly six years earlier to the day) pitched his record-setting perfect game for the home team against the Brooklyn Dodgers. Ralph Terry, who had gone 0-4 in Series outings finally managed to cross over in Game 5. As with the rest of the outings, both teams were locked in a tie late in the game. This time, it was Tom Tresh's turn to take the lead. The New York rookie hammered a three run, eighth-inning homer off Sanford who lost the game despite putting up ten K's in 7 1/3 innings. After a five day absence (due to travel and three rain delays) the Series returned with the Giants well rested and ready to even the score. Billy Pierce's three hitter and Cepeda's three hits and two RBIs netted San Francisco's the crucial 5-2 triumph that held the Fall Classic at a 3-3 standoff. Terry, who had given up the deciding blast to Bill Mazeroski in the 1960 heart-breaker, returned for the start in Game 7 and responded by holding the Giants to just two hits (and a 1-0 lead) going into the ninth. The Yankees pitcher had found some redemption winning twenty-three games during the regular season in '62 and was on his way to a complete-game victory. Pinch-hitter Matty Alou led off the inning with a perfect bunt for base one, but answered back by striking out both Felipe Alou and Hiller. Willie Mays, who had just completed a phenomenal forty-nine homer, one-hundred forty-one RBI season, rose to the occasion and blasted a double to right field. Maris made a sprinting grab and managed to reach cutoff man Bobby Richardson to hold Alou at third. Despite the great defensive stand by the Yankees, clean-up man, Willie McCovey and Orlando Cepeda were due up next. During the regular season, McCovey had tallied twenty home runs and fifty-four RBIs while Cepeda added thirty-five homers and one-hundred forty-four runs batted in. Houk elected to keep in, believing the right-hander would handle the Giants lefty. With a one ball, one strike count on McCovey, brought the heat, but the Giants slugger sent the offering toward right field. Second baseman Richardson moved slightly to his left and desperately reached up with his glove snagging the ball and another World Series title. 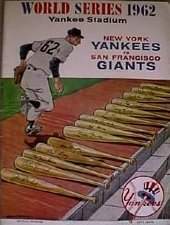 Once again, the mighty Yanks had been able to hold off a worthy opponent despite failing to win consecutive games at any point in the Series and getting .174 and .120 batting marks from two of their biggest threats, Roger Maris and Mickey Mantle. Their less-than stellar stats were certainly a compliment to the Giants pitching staff as the "The M&M Boys" had posted one-hundred seventy-eight home runs combined in the last two seasons. It mattered little though as the American League's dynasty had proven that they were back and ready for more. The San Francisco Giants had a better team batting average, earned run average, hit more home runs, triples, and doubles, yet lost the World Championship. In Game 1 during the second inning, Whitey Ford gave up a run ending his World Series record for consecutive scoreless innings at thirty-three and two-thirds (33.2). Imagine the pressure Ralph Terry felt during game seven as he faced Willie McCovey , who hit a home run off him during Game 2 . Why such intense pressure? Because Terry gave up Bill Mazeroski's Series ending home run during the 1960 World Series .